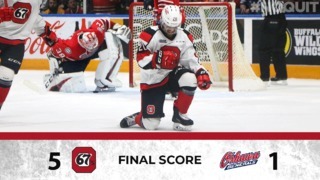 The Ottawa 67’s tightened up defensively in Game 2 of the Eastern Conference Semi-Finals on Sunday afternoon but didn’t miss a beat with the puck as the Barber Poles blanked the Sudbury Wolves 5-0. 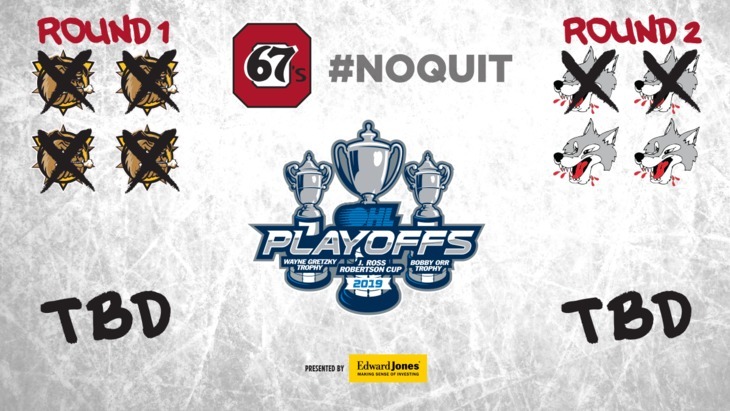 Ottawa has now scored 13 goals in two games against the Wolves to take a 2-0 lead in the best-of-seven series, which shifts to Sudbury for Games 3 and 4 on Tuesday and Thursday. DiPietro picked up the shutout while turning away 27 Sudbury shots. 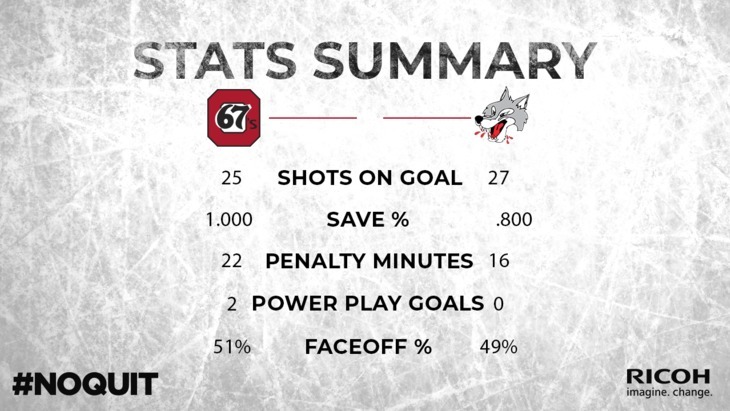 The 67’s, meanwhile, got five goals on Wolves goalie Ukko-Pekka Luukkonen for the second time in as many games, this time on 25 shots. 67’s defenceman Noel Hoefenmayer turned in another big game with two goals to give him five goals and five assists in just six playoff games this year. Tye Felhaber and Lucas Chiodo, both coming off hat tricks in Game 1, added a goal apiece on Sunday while Austen Keating also scored his first of the post-season. 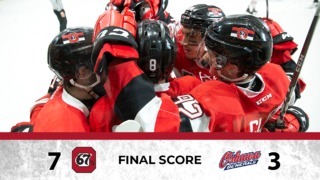 The 67’s will look to take a stranglehold on the series when they drop the puck for Game 3 at the Sudbury Community Arena at 7 p.m.
Fresh off a four-assist game on Friday night, Kyle Maksimovich had a pair of helpers on Sunday to give him six points in two games in the series. In addition to his goal, Tye Felhaber also added two assists to give him a three-point afternoon. After going goalless in the first round, Felhaber now has four goals and two assists in two games against Sudbury. Sudbury had a 37-36 edge in the face-off circle on Sunday. This was Mikey DiPietro’s first playoff shutout in the OHL. 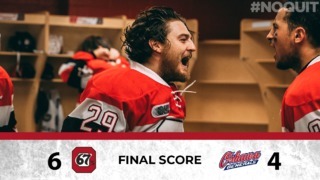 Sasha Chmelevski led the 67’s with four shots on goal.